Juliette and Adam have taken refuge at Omega Point and believe they are finally free from The Reestablishment. Juliette is trying to learn to harness her powers, and Adam finds out that he has the ability to disable the power of others. That’s why he has been able to be touched by Juliette without feeling pain, but if he lets his guard down around her he is finally able to feel the pain in her touch. Warner is captured and held hostage in Omega Point, which is when he begins to develop a relationship with Juliette. Omega Point is now at war with The Reestablishment, and people are going to get hurt. Juliette and Adam make out a ton and learn that Adam can be touched by Juliette because he has the ability to disable the power of others. That should be good news but Juliette learns that the more Adam is around her, the more he lets his guard down which means that… HIS DISABLING POWER turns off. Juliette tells Adam that she can’t be with him because she doesn’t want to hurt him (which she does after an intense make-out session) and then they are super angsty about the fact that they can’t be together. Castle reveals that Warner’s father (the supreme commander of The Reestablishment) has come to Sector 45 and has taken four of Omega Point’s men hostage. Juliette meets with the supreme commander (Anderson) to try and free the men. Adam and Kenji go with her but no one can see them because Kenji makes them invisible. Anderson chokes Warner, Juliette shoots him in the legs and is about to kill until Kenji stops her. Adam sees Anderson and reveals that IT’S HIS FATHER – Adam and Warner are half-brothers. The three are able to rescue two of the captives, take Warner hostage and Juliette distracts everyone from the battle at hand by cracking open the Earth with her powerful fist. Juliette is supposed to interrogate Warner, but then she discovers he has her old captivity journal and they just talk a lot about all the feelings. Warner reveals that he can touch Juliette without being hurt, and it’s because he is acutely aware of human emotions and can take on the Energy of others. If you are Team Warner, you know what happens in Chapter 62. If you’re Team Adam, let’s pretend those events never took place. Adam and Warner face off, Juliette stands between them, and then Kenji is badly hurt when he touches Warner because Warner was channeling Juliette’s energy. Warner escapes and returns to his father, the people of Omega Point go out to battle, and Juliette is captured. The Reestablishment: The name given to the government in control. Omega Point: A place for people coming together to rise up against The Reestablishment. Many have special abilities. Thank you so much for writing this!!! 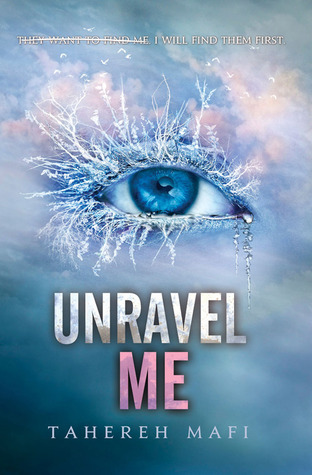 I wanted a refresh on what happened in Unravel Me before reading Ignite Me, but didn’t want to have to re-read the book! This is perfect! Thanks! Refreshing for Ignite Me! THANK YOU for this, wikipedia has failed with me this time. Thanks so much for posting this. Very helpful! Thanks a ton for posting this, it was a great refresher! Thank you so very much! I started reading ignite me today and felt like I needed to refresh my unravel me, this was absolutely perfect! !